Comfy stretch knit top with unique diamond pattern begins it’s flattering flare just after the bust line. Fully lined with scoop neck. 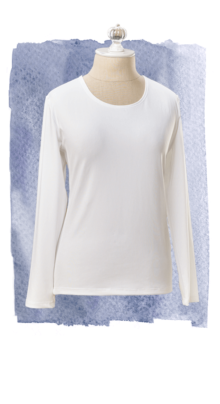 A great addition to any white wardrobe or casual clothing. Always sharp, always crisp. Beautiful with any White Elegance skirt. Shown with gore knit skirt. Maternity friendly. 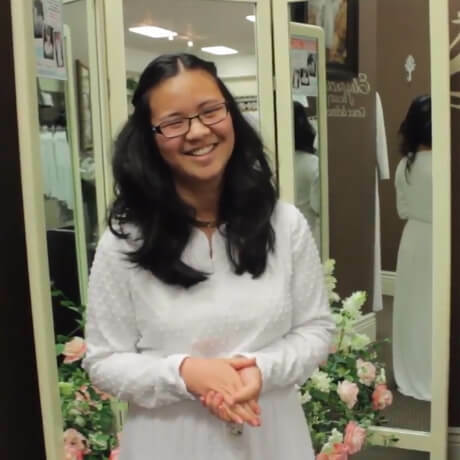 A combination of Bristol lace wrap top and coordinating skirt is a great contemporary look for LDS Temple clothing. The stretch lace is fully lined with knit that eliminates the need to layer. Wear the tie in the front, side or back fitting it exactly how you want it to fit. The gore skirt lines are as flattering as the soft knit is comfortable. 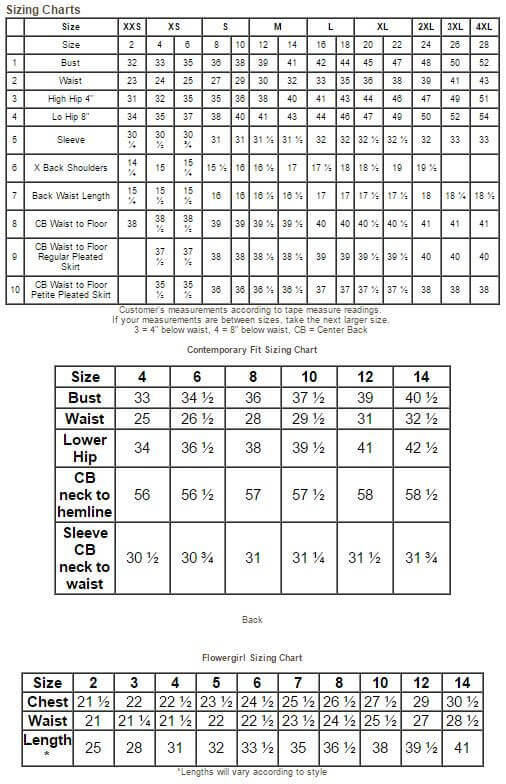 Select separate sizes for top and skirt. Washer safe and wrinkle resistant. The Aspen jacket is simply divine and paired with White Elegance coordinating georgette skirt and our long sleeve white T’ that doesn’t shrink, pill or lose its shape in the washer and dryer. 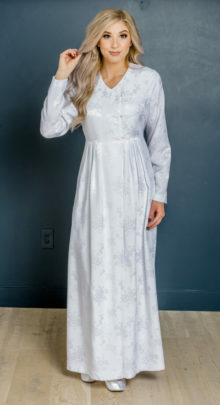 Our exclusive, unique fabric is carefully designed in a window pane style with small puffs of white rayon over pebble georgette for a lose, flowing style. The georgette skirt is one of White Elegance top sellers and is fully lined with soft denier, an elastic waist and one pocket. 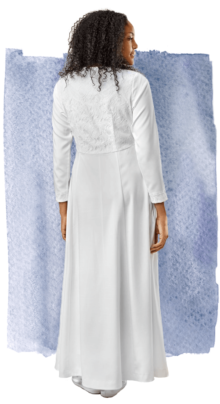 You can’t go wrong with this angelic outfit. Mix and match the pieces with your other Temple apparel.